Wally Willmott and Bruce McLaren and Eoin Young in 1962. This is the start of McLaren Racing. Patty McLaren was also part of this team. I am going to start a thread on Wally Willmott, the first employee of Bruce McLaren Racing. I hope the forum members will enjoy seeing the friends of Wally and hearing the different stories of what it was like in the day to be on a Formula One Team and what it was like in the beginning to be a part of Bruce McLaren Racing. "Bruce McLaren and myself and Eoin Young at the Perth Service station. You can see that we have used masking tape to cover all the leading edges of the car owing to the fact that the race track had just recently been surfaced with crushed gravel held in place with Tar (as was the norm on Roads in the area). Unfortunately the very hot sun melted the tar and flying sharp stones where a menace.The tow car and trailer was supplied by the same BMC dealer that owned the mini. The car was entered by Bruce McLaren and that was Bruce McLaren, Patty, Eoin Young and myself, the first race win of a group that was to become McLaren Racing." Wally explains this car here: " Bruce was there to run in the Australian GP in a Cooper Tasman car built by Harry Pearce and myself out of a car Tommy Atkins had intended to run in the non championship F1 races. The Coventry Climax motor he had ordered never showed up and Tommy was at a loss as to what to do with the car. Bruce wanted to run the Tasman Series and did a deal with him, and Harry and I fitted a 4 cyl 2.5 lt Climax. We won this race in December went on to NZ then back to Australia in February and won the following years Australian GP and the Tasman series of that year. Edited by Jerry Entin, 20 December 2012 - 22:00. Be sure to get in plenty of his Tasman Cup stories, Jerry! I hope the forum members will enjoy.. This is at the Riverside Grand Prix of 1964. This is the first time the team wore matching outfits. They have on white pants and matching short sleeve shirts and cowboy hats. Bruce McLaren in car. Wally Willmott on the left and Tyler Alexander at the front with Teddy Mayer. Bruce McLaren is in car with his cowboy hat on. Edited by Jerry Entin, 26 December 2012 - 16:24. Wally Willmott and the crew making the McLaren Formula One car. This was before CAD and other computer generated programs. You just rivited the chassis together and there you were with a Formula One tub. Left to right: Wally Willmott, Big Alan, Welder John (John Thompson), Charlie Scaranno & Robin Herd. I just noticed we couldn't see Bruce in the photos above. Wally and Bruce were not Boss and mechanic. They were genuine best mates. Bruce really enjoyed Wally and as they say Vice-Versa. That is Teddy Mayer Team manager at the front. David: Thank you for displaying your great picture of Wally. I'm looking forward to hearing more, I remember Wally from when he first came to England and worked for my Dad, Tommy Atkins. Wally was kind enough to share some of his photos of that time in a letter he sent to me; I'm hoping to see some of them here. Why are they wearing those ridiculous hats though? A British team ....New Zealanders.....?? Wally Willmott at Traco working on the Indy type Ford. Wally and Gary Knutson were at Traco trying to make this engine work so it could be used in the new McLaren Formula One car. Ursala: I know you are going to enjoy the photos that are coming. Derek: They are wearing those hats to spoof the Texans, the Chaparral Team all wore cowboy hats and I think Teddy Mayer thought it would be fun to show up with them. I don't believe anyone has seen these pictures until now. Kirby Guyer who worked at Traco took them. She was kind enough to allow the forum members to see her pictures. This past summer at Mosport Canada. 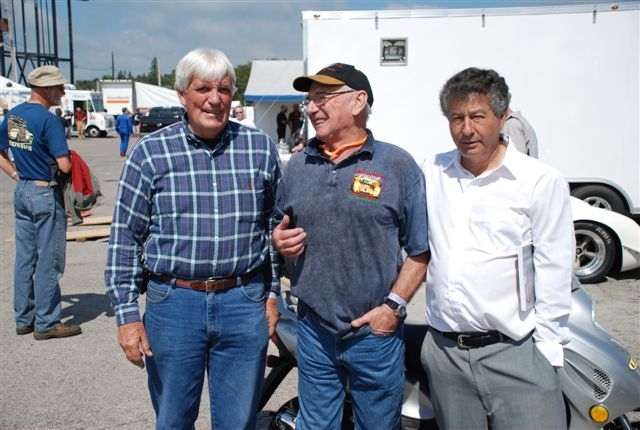 I hadn't seen Wally in probably 40 years, I was at Mosport, Canada for the CanAm reunion this summer and was told Wally was there helping Jay Esterer. I went up to Wally and asked him if he knew who I was. He looked at me and I said Jerry Entin,from your youth. He smiled and hugged me and we had a great time visiting all weekend long. Edited by Jerry Entin, 17 December 2017 - 16:26. It is such a joy for Wally to be able to tell Amanda about her dad and the great times Wally and Bruce enjoyed. demonstration lap in an M4 one of Wally's favorite McLaren models. Edited by Jerry Entin, 26 December 2012 - 16:49. Wally Willmott in the ex Denis Hulme M 23 McLaren. 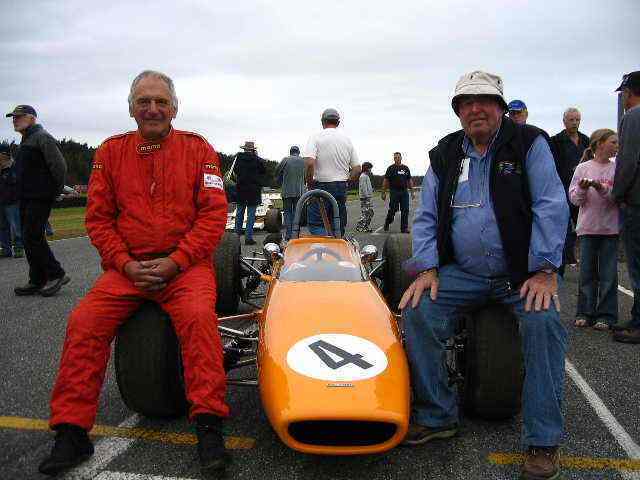 At the same meeting at Teretonga, Wally had the priviledge of driving the ex Denny Hulme M23 now owned by Phil Mauger of Christchurch, New Zealand. Although built and raced after Wally Willmott had left McLarens, it made him very proud to have been part of the evolution that led to this car. You are right, great photos! I am so pleased to see them and to see Wally again. Wonderful to see Amanda too. Thanks for sharing, I am looking forward to more photos. Wally Willmott with Jay Esterer at Mosport this last summer. Jay Esterer of Edmonton, Canada had Wally come over for the CanAm reunion. Wally was mounting video cameras on Jay's car and got some unbelievable footage. Jay Esterer won the CanAm reunion held at Mosport. Billie Kokotylo is the crewman seen on the right. Ursula: I am glad you are enjoying seeing Wally and his friends. Derek: They are wearing those hats to spoof the Texans, the Chaparral Team all wore cowboy hats and I think Teddy Mayer thought it would be fun to show up with them. Ahhhh.....thanks Jerry.. that makes sense now..they were, as the Brits like to say - "taking the p...s"
The one with Bruce's daughter in it and, I am sure she will forgive me if I say this, now approaching middle age, made me think that Bruce is rather like James Dean, in that in my mind, he has never got older than he appears in the original 1962 photo you hnave posted - and that is "kinda nice" as Americans say. The fellow in the Deer Stalker hat is John Bolster who did commentary on the races. Tommy Atkins is fellow forum members UATKINS dad. He entered cars for many including Bruce McLaren and Roy Salvadori. Wally Willmott was working with Harry Pearce for Tommy Atkins racing group called High Efficiency Motors in England. He then went on to help Bruce McLaren. Bruce had recommended Wally for a job with as Harry Pearce called him the "Governor", that was Tommy Atkins. "Because Coopers had not finished the second 'Works' V8 car for Tony Maggs in time for Monaco, Tommy Atkins was asked to loan the the low line that he had campaigned for Bruce in the non championship races. This was my first taste of Formula 1 championship racing, and Bruce McLaren driving the works car won the event." "The - as always - immaculately presented 4cyl 1500 cc F1 car down at Goodwood for a days testing. This was just prior to the Easter meeting at Goodwood where Bruce won the Lavant Cup." Some great photos relating to Wally's motor racing career beginning to appear and nice that Ursula is part of this thread already. My interest goes back to the early days of him working with Bruce. Especially their efforts at the 1962 Australian Grand Prix at Caversham in Western Australia. This being where they ran the unique 'Atkins' T62 Tasman Cooper successfully with Bruce's victory. Also that at the same meeting they ran a 997 Mini Cooper in the sedan races. I know it's probably a miniscule moment in Wally's career, but there's 2 reasons for my interest, I'm a Mini Cooper enthusiast and would like to read Wally's recollections of the preparation of the 997 Mini Cooper and the 1962 AGP as a whole. Such as did they (Bruce & Wally) arrive at Caversham with a Downton kit of parts to modify the 997 borrowed from the Western Australian BMC distributor? Just to help him recall the car it was the grey with a red roof. I say this because there was a grey & white 997 used beforehand by Bruce in New Zealand during the Tasman in 1962 (the same year Ron Flockhart ran one too). Then a BRG & White Mini Cooper used in NZ during the Tasman in 1963. If Wally can shed some light on these two cars too, then that would be great. Also the T62 has a lengthy family history. Without going through things too finely (although I probably have anyway), Bruce obviously used the T62 before is passed to Lex Davison's ownership and use. Then Lex did one of his racing car 'updates' that allowed Rocky Tresise to step into the car and run in the 1965 Tasman Series. Unfortunately an illfated one, as Rocky had his fatal Longford crash in the car, which also claimed the life of young motor racing photographer, Robin D'Abera. Rocky's passing being the second tragedy for 'Ecurie Australie' in the space of just over a week. With his 'boss' having also tragically died at Sandown beforehand. The Davison estate then advertised both Lex's damaged Brabham & the damaged Cooper T62. The buyer was Wally Mitchell. The way I understand it the Brabham would be repaired but the Cooper was raided for some parts for his RM1 sports car. This would also end in further tragedy with Wally crashing while racing RM1 at Symmons Plains. Whereby he would suffer severe burns, that around 6 weeks later would take him too. Sometime not long before Wally's crash had taken place though, my uncle, John Dalton had done a deal with Wally to procure what was left of the T62. But he hadn't taken possession of it before Wally's crash and subsequent death. Finally when everything had settled down my uncle approached Wally's widow and he was able to acquire the bones of the T62. Being told to take whatever was his. When all this was taking place I would have been all of 2 or 3 years old. Fast forward to 1978 and would have still only been 13 years old but looking for some pocket money to buy a new bike. So in the September school holidays my dad arranged for me to help Uncle John tidy up to earn a few bucks. Part of this, as I recall, involved the shuffling of the bones of 3 Cooper Climax he had acquired by then. These all being under his house and there was a very bent chassis and bodywork, not that I knew the story then. At that same time and as an outcome of my helping I was taken to the practice day for big Sandown 'Fangio' meeting. It was a big meeting for me, being my first Sandown. Having only ever been to Winton and Lakeside previously. I recall my uncle (who I have to admit was 'a bit of a dealer') was letting various people know that the 3 Coopers were for sale at that Sandown. As an aside Bill Patterson had borrowed some of my uncle's Cooper parts so he could run his Cooper at this meeting. But none of the 3 Coopers would be sold until into the 1980's and several moves for my uncle's collection in between. Cutting to the chase the last time I recall seeing the T62 was in its rolling chassis form in 1987 at Melbourne's Exhibition Building's Classic Car Show. A new chassis having been instigated and built by Charles Singleton I think. It had no bodywork at that stage and ownership had finally changed hands. I think there was 2 enthusiasts involved but Roger James name rings a bell as being one of them. The car would finally be completed and in the recession Australia had to have in the very early 1990's meant the car was sold. Seeing the car heading for the USA. Just recently in UK magazine 'Octane' I saw it for sale (but still in the US). Unfortunately I can't ask my uncle because he passed on a few years ago. So after all this I hope Wally can add some information to the questions closer to the beginning of this post. Many thanks for starting the thread Jerry and please pass on my thanks to Wally. Testing the M5A McLaren at Goodwood with Denny Hulme. This was prior to Wally Willmott's last race meeting with the team. The 68 South African GP at Kyalami. "The Cooper Mini was supplied by a local dealer and I brought a set of extracters and carburettors as hand luggage from England to Perth, I fitted them on the Mini and from memory Bruce did extremely well." Wally Willmott's sailing Yacht the Zora II. "Boats come in all shapes and sizes, they are always too small in the water and too big out of the water. Many compromises have to be made. Zora II, at 10 meters (33ft), constructed of steel, was selected because she was easily sailed short handed and affordable to maintain and strong enough to survive encounters with coral reef. She took myself and a lady friend from Australia to New Zealand and then on to Tonga, Fiji and New Caledonia. On arrival back in Australian waters the need to work and the pressures of living in a confined space eventually took its toll on the relationship and we parted ways, leaving me to continue life as a 'Single handed' sailor." Zora II out of the water for her Winter Checkup. As we land lovers would call this Wally's kitchen. Very small by household standards. It is home to Wally however. Wally Willmott at work in his office. This is aboard the Zora II. As we land lovers would say Wally is in his private setup. "Unfortunately living life at a Marina can become stressful, and the community would often meet (really often) to let the pressure down." Jim Hall and Wally Willmott at Nassau in 1964. In 1964 after a visit to Rattlersnake Raceway in Midland, Texas. Wally Willmott was invited by Jim Hall to go to Nassau with the Team to lend a hand. He had a great time and from there he headed to the Tasman series. Wally Willmott's sailing Yatch the Zora II. Jerry do you know where this was taken? It looks like it could be on Lake Macquarie NSW Australia. Very close to home. Just to add my 20 cents worth, my only mistake was to to call the T62 a Tasman Cooper - but given it's unique status isn't such a bad thing anyway. Especially given that it did race in Tasman events of 1963, 64 & 65. I am aware that the Tasman Series didn't start until 1964, hence why my only reference to it as a Series is in 1965. These races have for many a long year been generically tagged with Tasman by enthusiasts and motoring journalists alike and yes some get it wrong by adding Series in reference to races prior to 1964. Maybe it's time there was a definitive Tasman book written covering all facets prior to it becoming an official Series in 1964 and beyond. There's so many motor racing books, but this is one major chapter of motor racing history that is lacking (and if there is a book already it's not widely known). My original intent of posting in the 'Wally Willmott' thread was to tell the tale as I know it of my family's involvement with the T62 and ask a couple of questions, if Wally was able to help via Jerry. Rightly or wrongly, the car may very well have disappeared forever given its ill-fated history. My uncle certainly believed that it would have been the case had he not salvaged it. Some may consider that it should have disappeared. But if this was the case then historic racing grids across the globe would be somewhat sparse given the number of drivers who died in racing cars of the period. With those very bent racing cars being returned to the track either in period or may years down the track. I have to admit that I was spooked by the history of the T62 when I knew what had gone before it. But as with many things like this we eventually accept it as history. Something none of us can change. "The Cooper Mini was supplied by a local dealer and I brought a set of extracters and carburettors as hand luggage from England to Perth, I fitted them on the Mini and from memory Bruce did extremly well." Please pass on my thanks to Wally for his comments to my question about the Mini Cooper that he prepared for Bruce at Caversham in 1962. I know it's a very long time ago, but if Wally has any other recollections down the track about the Mini or the T62 at that Australian GP event I'd be interested to read about them. This was at Silverstone while Wally Willmott waits impatiently to get on with the job at hand. A happy trio. Chris Amon,Tyler Alexander and Wally Willmott at St. Jovite Canada in 1965. Chris Amon has just won at St Jovite. Bruce McLaren was driving at Monaco for Coopers on this same weekend. He finished 5th in the race won by Graham Hill. This is again the construction of the first McLaren Formula One car. Bruce McLaren is now in the picture with Wally Willmott and also Colin Beanland is at the other end in this photo. The mechansium they are building the car on. Was also know as the missile launcher or the Cannon. "The cannon was a team effort, powered by a mixture of Oxy acetylene, with an ignition coil suppling the spark to the plug. I am pretty sure that it was Garry Knutson who machined the hemi combustion chamber and supervised the welding after our first improvised breech came out at about the same velocity as the projectile (usually a paint can or what ever else we could find to fit the bore size. The concept dated back to before my time at the Cooper F1 team workshop, but I embraced it with open arms and there are many stories to be told about "Events". Most would make "Safety Officers" hair stand on end - but boys will be boys and some times in the middle of yet another all night session - a little light entertainment is called for." The windows seen behind where everyone is working were blown out by the cannon. Gary Knutson isn't in this picture because he is the one taking it. This was taken on November 22, 1963 the day JFK was assasinated. Wally Willmott will tell of his feelings this day: This was one of those "Where were you when" .... moments. I arrived at Rattlesnake Raceway in Midland the day JFK was shot. "Jim Hall had obviously not been listening to Ralph Nader. He spoke highly of his Corvair Spyder and enjoyed driving it." Edited by Jerry Entin, 02 August 2009 - 14:13. I think the practice/process was fairly commonplace, as Len Terry tells a similar story of the Rocket Launcher at Lotus in the late 50s. Jim Hall warming up the Chaparral at Rattlesnake Raceway in 1963. That is Gary Knutson at the back of the truck. "After witnessing several attempts at a cannon at McLaren's when I moved there, I volunteered to assist with the device made from the F1 fixture tube. This was a much larger bore and we used a mixture of oxygen and acetelyne from the welding plant. The torch would be lit, the flame adjusted to a neutral condition, and then extinguished by pressing the torch tip against something. This left the torch flowing a perfect mixture for our purposes. With the new "hemi" breech and spark plug in place at one end, the torch was inserted into the open end and allowed to flow for an indeterminate period of time. After we had decided that the tube was probably full, the torch was removed and a piece of plastic was taped over the end to contain the mixture. I had brought along a small magneto booster coil which would produce a nice spark at the plug when hooked to a 12V source. The cannon was inside the main workshop which was long an narrow and had windows over the workbenches which ran along the one wall. We were now faced with the problem of how to light off the cannon. After some persuasion, Big Alan was conned into being the one who would clip on the 12V battery lead. The rest of us had gone outside and were standing in the driveway when Alan touched the lead to the battery. The noise was deafening and then Big Alan sort of stumbled out the door. The inside of the shop had disappeared in a cloud of dust, that had accumulated over many years, rained down from the rafters of the building. The cannon's firing had created a low pressure area inside the building and this caused all the windows to blow inwards, covering the benches and everything else in the way with broken glass and debris. The mess was unbelievable! It took all our efforts and many hours to clean it all up. Harry Pearce, the works manager, was kind enough to have someone in early the next day to replace all the windows. I don't recall any problems with management but they must have been fairly upset at the time. We were also very lucky that Big Alan didn't loose his hearing. The last test with the device was done in the F1 build area which had a large two piece wooden door leading out to the driveway. The cannon was pointed towards the door and this time loaded with a projectile rather than just the plastic over the barrel. The missile was a pint tin of resin that had cured in the can. It was a perfect fit in the bore. I don't know what we expected, but the end result was a large ragged hole through the wooden door. I don't believe we ever found the projectile. The door had to be patched and we were in the doghouse again. At least this time, there was no other damage. That ended the cannon tests during my career." Roger Bailey with goggles driving the Cooper parts Transporter. "On the wharf at Dunkirk on the way back from Spa we met up with Roger Bailey, at that time mechanic for the Tyrell run Works Mini Team. Roger had broken a windscreen driving up through France, and as no replacements were available Roger had donned some borrowed drivers goggles and carried on." At the Mini on the right stands John Cooper, Ken Tyrell (back to camera) and John Coombs. "The works transporter was driven down to the waterfront car park where it would stay for the weekend, being visited if parts were needed, or to get something we had forgotten to unload. Two cars three mechanics and all the spares were squeezed in. The official paperwork for customs listing spares was worded very loosely and was several years old and nowhere near accurate. We were just expected to talk our way through every border crossing. Quote Jerry "the torch was inserted into the open end and allowed to flow for an indeterminate period of time"
This is, of course, the exact technique being used in the current spate of ATM robberies in Australia. Pat: In that case maybe we shouldn't explain in detail how you blow things up. I hope no ATM Bandits are reading this forum. "Here in the aformentioned public car park is Bruce McLaren's winning car. It was the done thing to drive the race cars from the workshop to the race track - and back if they were still running - otherwise we would tow them behind a rental car." This was located on a side street up the road from the main Cooper Garage/Factory was the F1 Shop. "As I understand it it was used originally for building horse drawn carriages and inside the very uneven floor was in part Cobblestone. In the front behind the painted over windows Fred Bedding and his son Pete Bedding handcrafted the Aluminim bodies. Out in the back section we would build the cars at the start of the season and race prepare them. The transporter would be loaded out on the street." For anyone who is enjoying seeing Wally Willmott's pictures and you want to know the whole Cooper story, I suggest Doug Nye's "Cooper Cars", this is the bible of Cooper Cars from the starting to the end with photos of everyone Wally has talked about. Fantastic stuff Wally & Jerry. I'm not sure whether Wally would have had any input with Doug's 'Cooper Cars' book. But I'm beginning to think if Doug is seeing these priceless shots (I dare say he probably is), Wally's recollections and photos would have been handy in the late 1970s/early 1980s when Doug was researching & preparing for the book. But no doubt it all comes down to technology of the time. No emails, no TNF... just lots of phone calls to try and track down those involved. Thank you. Cooper 997: Wally Willmott has never really told his side of the racing to anyone before George Begg wrote a book about Bruce McLaren. He has never shown these pictures on any site. He is letting the forum members enjoy his photos on this site. One of Wally's fellow McLaren workers, Howden Ganley rode by the Cooper Formula One workshop today and this is what he saw in his words: "I drove past the old Cooper F1 shop on Langley Road yesterday (January 7th ). It has recently been demolished. It had been in a bad state for some time - I think since the Cooper family sold it. I had meant to photograph it some time ago. There was a printing company in it. The main factory on Hollyfield Rd ( just off Ewell Road ) is still looking good, the Police seem to be looking after it very well. The original showroom on the corner of Hollyfield Rd and Ewell Rd is still a car sales place. Just as it was when Stirling Moss went there with his father to look at a new Cooper 500 . And the pub is still there as well. 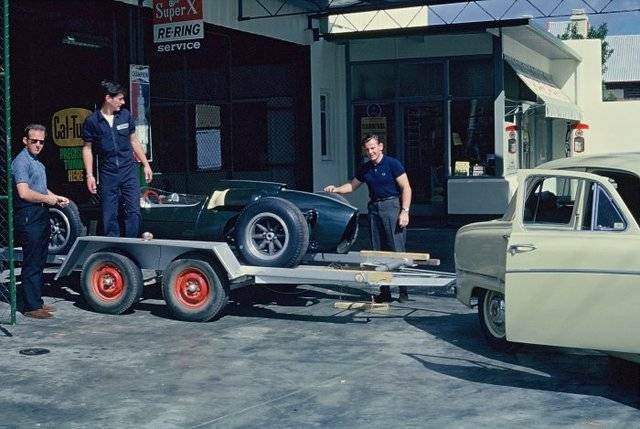 Here is the 1963 Cooper Formula One Team Transporter. This was the ex Bowmaker Yeoman Racing Transporter. They ran Lola cars in Formula One.